Tom North’s book inspired us to learn TM! My wife and I made the leap to learn Transcendental Meditation (TM) after reading True North: The Shocking Truth about “Yours, Mine and Ours”. Our TM teachers, a married couple, asked us about what our inspiration for learning was. We told them about the book and decided to secretly send them a copy as a gift. Several weeks later I received a call from the wife thanking us for the gift. She also relayed that despite her husband being a picky reader, he thoroughly enjoyed the book and had a hard time putting it down! This is an amazing tale of personal transformation and success from living in paradise with an amazing supportive father to living in hell, fending for his life everyday. Tom has been a close friend of mine for many years and I have been blessed to witness his writing process and personal progression through the telling of his tale. Anyone who has anything negative regarding him and his story is CLEARLY missing the point of this story. He is bringing light to a very dark issue that too often gets swept under the rug. No more!!! The domestic abuse rates in this country are astronomical and will continue to rise if cherished “classic American Family Stories” like this are perpetuated in lies as they have been for too long. Its time to stop glorifying lies and let the truth be told! This story is truly inspiring and brings hope to those that have none. It puts life’s trials into perspective for the reader, letting them know there is hope, and things will get better. However, we must make the decision to make them better for ourselves and others! No one can do it for us! I applaud Tom and his courage for telling his story and showing it to the world when he knows it will anger those that wish to keep the illusion alive and perpetuate the lies. While some many not relate to certain sections or think they are too long, they need to realize that he put those sections in there for a reason and left them in there for a reason. And while those reasons may not be apparent to you, they might be for someone else. So please people, when reading this story, keep in mind the intentions with which it was written: Compassion, hope, love, truth and light. Bravo Tom!!! The world needs more brave authors such as yourself! 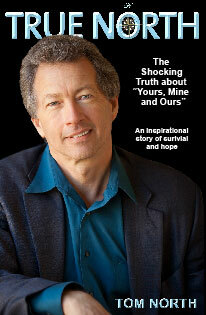 In “True North- The Shocking Truth about Yours, Mine and Ours”, author Tom North takes the reader on his amazing journey of survival and catharsis. Tom’s skills as storyteller and motivator certainly do not disappoint in his frightening tale of growing up in the famed Beardsley household. The colorful magic thread of 60’s era adolescence in Carmel is woven around the dark backdrop of child abuse and neglect. Tom’s family secret was so well guarded that he didn’t reveal the cruelty of it, even to his closest friends, until recently. Against all odds, Tom North survived to become a successful businessman, well-grounded, loving spouse and parent, and advocate of child abuse prevention. The miracle of his survival comes from his freedom found through profound self-awareness, group therapy and ultimately, forgiveness and love. Anyone struggling with pain caused from domestic violence or child abuse will benefit from Tom’s powerfully inspiring story of his path to healing. Thank you Tom, for having the courage to share your story that may help so many people. Thank you, Tom, for having the courage to tell your true story! -Scott Kalechstein Grace, Author of Teach Me How to Love, and If Dr. Seuss Studied Eckhart Tolle. “True North gave me both the inspiration and encouragement to “follow my heart and, by so doing, I am discovering a uniting and loving presence that is always there to guide and nurture me.